As a screen for the living room of someone with loads of gadgets and a penchant for digital media, there is no better value choice than the LG 42LS570T. In a pantheon of TVs as vast as LG's, it can be tricky to pinpoint exactly where the sweet spot is. But by balancing smart TV with awesome networking - albeit wired - myriad ins and outs, and a thoroughly decent picture, the 42-inch LG 42LS570T could be just that. Full HD resolution features on this Edge LED-backlit LCD panel, while the LG 42LS570T also counts a Freeview HD tuner, an element of home networking, digital file playback from three USB slots and a generous helping of four HDMI inputs. In terms of picture quality there's 200Hz double-scan motion processing, which at this price-point of £499.99 (around AU$775/US$815) is another boon. Two features fast becoming defaults on modern TVs are, however, slashed; 3D doesn't make an appearance on this 42-inch television, and nor does Wi-Fi, although a dongle is available from LG. 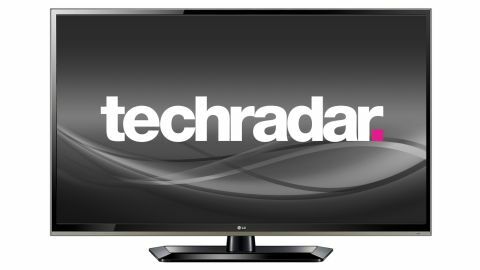 However, smart TV's holy trinity of BBC iPlayer, YouTube and an open web browser makes the LG 42LS570T a real stand-out at its price. Looks-wise the LG 42LS570T is nothing special, combining a simple 15mm-wide gloss black bezel with a slightly larger undercarriage. The latter is fitted with speakers and a 11mm-wide grey plastic strip that's designed to look like brushed metal. It's not, but the overall look of the impressive 35.5mm slim LG 42LS570T is at worst inoffensive. The same may not apply to the desktop stand, which is a little heavy duty, though its central gap proves a great place to store idle TV remotes, or gaming accessories such as a Kinect. Part of LG's LS570 Series, the 42-inch LG 42LS570T is joined by the 32-inch LG 32LS570T and the 37-inch LG 37LS570T, the latter an increasingly rare screen size that's not likely to last for another year (expect 39-inch screens to replace them due to recent advances in glass-cutting tech). In comparison to sets lower down LG's ranges, such as the LG LS5600, LG LS3590 or LG LS3500 Series, these LS570 TVs are the lowest priced sets with Freeview HD tuners included. If you really can't do without a Wi-Fi module, a variant is available; the 42-inch LG 42LS575T is exclusive to Currys. The step-down LG LS5600 Series, which encompasses the 32-inch LG 32LS5600, 37-inch LG 37LS5600, 42-inch LG 42LS5600 and 47-inch LG 47LS5600, drops to basic Freeview and also manages just two HDMI inputs as well as a mere 100Hz refresh rate. Cue possible problems with motion blur and resolution loss, though these four Edge LED-backlit LCD TVs retain a Full HD resolution. Low-cost, non-3D plasmas come in HD-ready (the PA4500 Series) and Full HD (PA650T Series), the latter with Freeview HD tuners. Those looking to go 3D ought to try LG's impressive Cinema 3D sets, the excellent 55-inch LG 55LM660T, good value 47-inch LG 47LM760T and step-up 47-inch LG 47LM860V. And its Active Shutter 3D plasmas - including the LG 50PM670T - are great value big screen options.